The history of photography in Iran has established its lineage with the documentary form. As a powerful tool in the hands of every citizen, the medium has functioned as a mirror in a country with a unique geopolitical condition – the desire to be a sovereign republic through a transparent and accountable system – the failing of which marks the beginning of our resistance through popular media. During the last decade, without any critical change in our socio-political circumstances, photography has undergone a process of its own conditioning – a situation in which there is a tendency towards ‘staged’ imagery, a renewed form of the tableau. 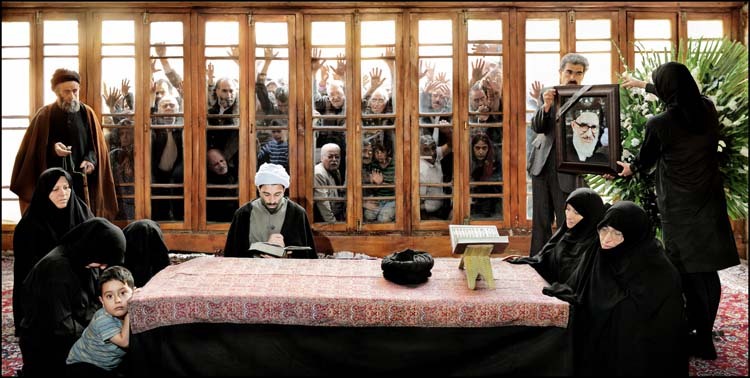 The Iranian manifestation of ‘staged photography’ as a unique practice-oriented genre is a ‘behavior’ of photography that allows a free interface with the remaking of a picture that was originally shot in documentary mode. Accordingly, a public atmosphere is reconditioned to a private order. Such a tendency in Iranian photography, a term I use specifically to identify with the resident practitioners of the medium, is occasioned by international developments in new media areas, in which conceptual formats have taken precedence. Our particular blending of digital morphing and fine art has managed to underscore and emphasize an intellectual frontier: that of the image as a potent metaphor and private message. Such an achievement in emerging countries like Iran, where the current generation lays great emphasis on contemporary practice as a bridge to the outside world – has consequences within the country which are difficult to envision, preempt or even control. This tendency towards the staged format, then also points to state enforced restrictions and artistic freedom, and hence the artists’ commitment as a reactionary voice. For some, the presence of professional photographers in urban spaces has stirred resentment and morphed the very sense of an active ‘photo journalism’ into a taboo, i.e. something that is practiced with trepidation. The photographer then is not merely a reporter of realities, but a prism or a filter through which his/her ideas may be refracted, and his aesthetic, explored. This is where Iranian society has a an ephemeral understanding of itself, incessantly experiencing the cultural gap between public and private spaces. This gap has given birth to various types of subcultures, casting its influence over ideology, politics and gender-based studies, escaping the fetters of conventionality and experiencing a freedom of expression. This issue of PIX provides a glimpse of these prospects or positions – a familiarity with the motifs that decorate Iranian photographic culture in which conflict is converted into creativity. And this, I feel, is the true purpose of art in the present.